In our sport, great images are a given, whether it’s long-lens shots of our cars on the track, brightly colored pics of our drivers or well-timed captures of the pit crew in action. But here’s a different kind of image that we’re excited to share, one that even the most dedicated fans may not have seen before. Yes, that’s it, right there. Fascinating stuff, but you’re probably scratching your head, wondering what exactly that is and what it has to do with racing. To understand what you’re looking at, you’re going to have to think small. Really small. 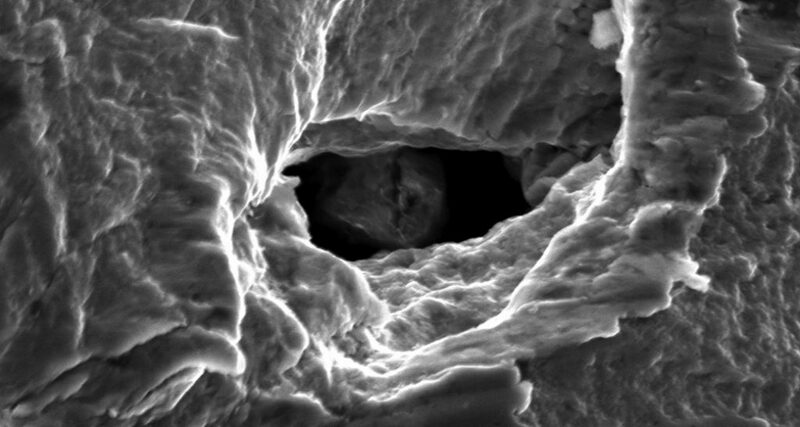 Because the photo above is the surface of an engine part as seen through a scanning electron microscope (SEM), and magnified at a whopping 3,300 times the power of the naked eye. So why are we looking at engine parts that closely? Because zooming on the tiniest aspects can provide huge clues to how our engines perform during a race, and this time spent in the lab can lead to improvements on race day. After each race, our engines are torn down and the components are sent to a lab within the walls of ECR Engines, where a team of analysts look at these parts using high-powered metrology tools. This team – basically, they’re our measurement and examination specialists – looks for clues that show how the wear and tear of competition can affect the overall performance of an engine. 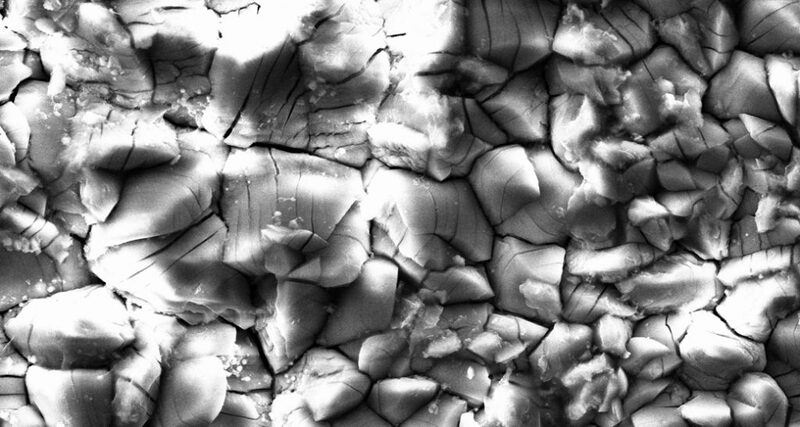 These stunning black and white images are produced by one of the most specialized pieces of equipment in the lab, a scanning electron microscope. 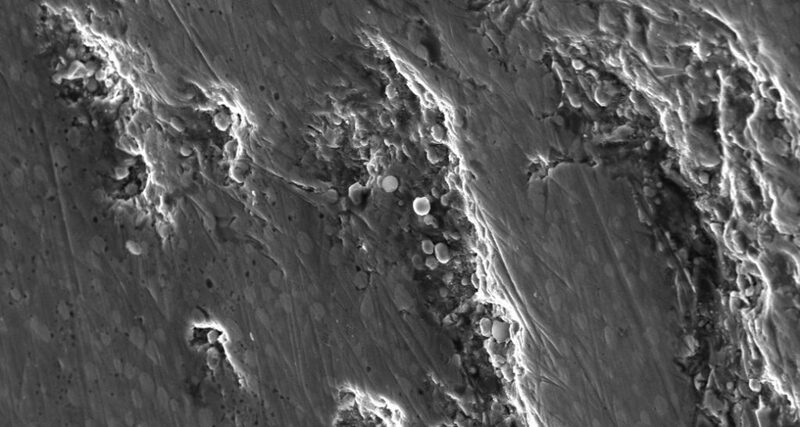 The SEM has a magnification power that is several hundred thousand times greater than the human eye; most of the images that we’re sharing here have been magnified between a few hundred and a few thousand times. Do factors that small really affect the performance of a 740 horsepower engine? Absolutely. Take, for instance, the image above. At first glance, it looks like you’ve locked eyes with a Game of Thrones dragon, but it’s actually the cross-section of a valve spring magnified 5,000 times. 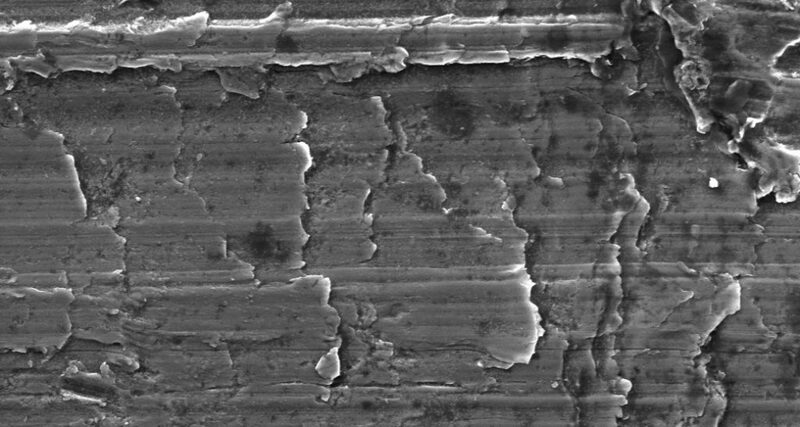 The round object in the middle is a non-metallic oxide – a tiny flaw, but a flaw all the same – embedded in the center of the spring. It’s so small it has to be insignificant, right? Not exactly. When an engine is running wide open, the valve springs inside contract and flex 4,500 times a minute – that’s 75 times every second! This particular spring was used in a test engine and, at 4,500 rpm, that tiny flaw in the metal made it slightly weaker, causing the spring to break. When a valve spring breaks, it doesn’t stop there: that little defect is the start of a catastrophic series of events that typically results in a complete engine failure. Yes, a brawny 500 pound engine could potentially be brought to a standstill by an imperfection smaller than a grain of sand. By having both the tools and the team to identify even the smallest factors that could pose problems for our engines, we can correct those issues in advance and reduce the chance that something will go wrong on the race track. ECR designs and builds engines with a level of sophistication that requires an equally well-studied analysis of how they’re performing. That’s why this metrology lab is such an asset to our teams. Not only does the lab allow ECR to identify potential problems like that valve spring and quickly correct them, but it also lets our in-house engineers observe how components function and give feedback to ECR’s Research and Development. The R&D group might update the design of a particular part based on the metrology team’s findings, in order to optimize its function so that it better contributes to the overall potential of the engine. 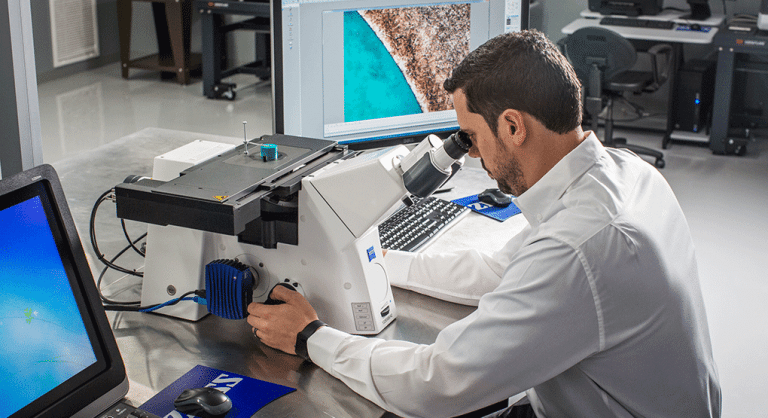 Making sure our engines run at peak performance for hundreds of miles can come down to identifying factors or flaws that are only a few microns wide. And we have to admit, even those imperfections result in some pretty cool pictures.